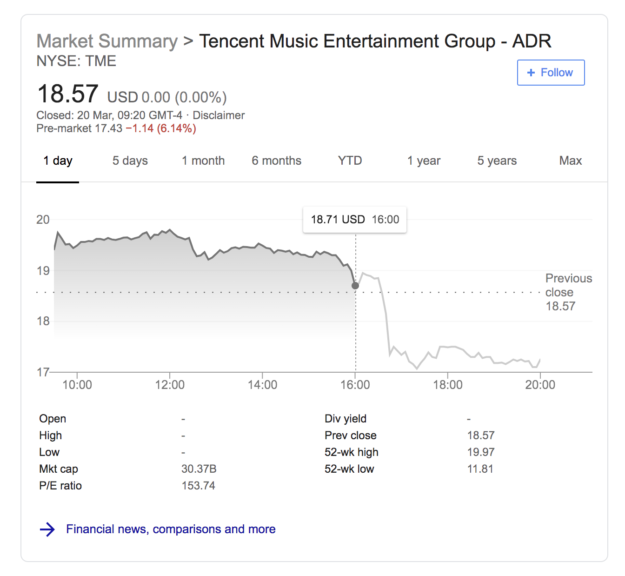 China-based music streaming service Tencent Music Entertainment (TME) has published its full year and Q4 earnings for 2018 which is its first earnings report since its IPO on the New York Stock Exchange in December. In the three months ended December 31, 2018, TME’s total revenues increased by 50.5% year over year to RMB 5.4 billion ($785 million). 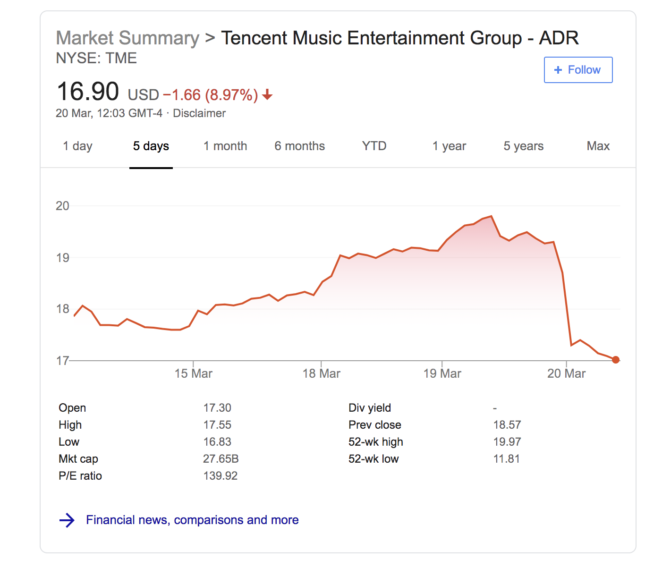 The company posted a net loss of RMB 876m ($127m) which it owes “to a one-off” RMB 1.52bn ($221m) accounting charge related to equity issued to its major label partners Warner Music Group and Sony Music Entertainment. According to TME, revenues from online music services for Q4 increased by 45.0% from the same period of 2017 to $221m, which was driven by increased revenues from user subscriptions, sublicensing music content to third-party platforms and sales of digital music albums to its users. Revenues from social entertainment services for Q4 increased by 52.8% year-on-year to RMB 3.88bn ($564m) driven by the revenue growth in both TME’s online karaoke and live streaming services. In the full year ended December 31, 2018, TME’s total revenues increased by 72.9% to RMB 18.99bn ($2.76bn) with a net profit of RMB 1.83bn ($267m). Revenue from paid music through the sales of subscription packages was RMB 695m ($101m), up from RMB 505m in Q4 2017. In spite of what appears to be good results for the very recently NYSE-listed firm, its “cost of revenues” (owed to an increase in content fees and revenue sharing fees) for Q4 2018 increased by 62.5% to RMB3.56bn ($518m) from RMB 2.19bn in the same period of 2017. The content fee increase has come from spending on in-house production of original music in addition to music content licensed from music labels and other content partners. The mixed results, including the soaring expenses and the net loss in Q4, have clearly affected Wall Street adversely – with TME shares (dipping below $17 (March 20), having closed at $18.57 on March 19 and falling over 7% in overnight trading. “To fuel our growth for the years to come, we are firmly committed to continuing investing in the premium content offering, innovative products, and proprietary technology. Going into 2019, we will continue executing relentlessly our mission to use technology to elevate the role of music in people’s lives. “Through content enrichment, product innovation, and technology development, we have been able to attract and retain our vast user base and construct a self-reinforcing virtuous ecosystem. “In content, we expanded our strategic partnerships with well-known domestic and international music labels as well as produced more proprietary content such as music-centric variety shows. “In product and technology, we further enhanced personalization which resulted in increased music consumption driven by recommendations, and also offered more features that enable users to engage with music-related short videos. “We achieved strong operating cash flow throughout the year. We continued to invest in our content offering, including through partnering with more domestic and international music labels and producing more proprietary in-house content to meet user demands for diverse forms of music entertainment.